In Ishim, Russia, a young girl named Tonya copes with the hardships of orphanhood. The gelid bite of winter compliments the teasing she receives from both her peers and caretakers. Her only companion is the tall tree in the orphanage's yard, with which she shares loneliness and despair. Elsewhere - space, actually - Superman battles to aid Wonder Woman and Martian Manhunter who've come under control of Darkseid and the pollen of the Harmony Cinders. The Lord of Apokolips aims to destroy Earth and send the Man of Tomorrow back to the farthest yesterday - the earliest nothingness of the universe. Darkseid's plan goes awry, however, and Superman saves his friends, Earth, and himself once again. Back at the Ishim Orphanage, little Tonya is passed over again by potential adoptive parents. She finds solace in her only friend, the old tree. High in the branches, Tonya loses her grip and falls... and is swiftly caught by Superman. Tonya relays to her hero how anywhere is better than the bitter, dreary orphanage. Superman comforts the pained little girl - he was an orphan, too. Superman soars off leaving Tonya with his cape and a new friendship. Story - 3: I almost gave this story a 2, but I love the tale of Tonya so much that I couldn't bring myself to do it. 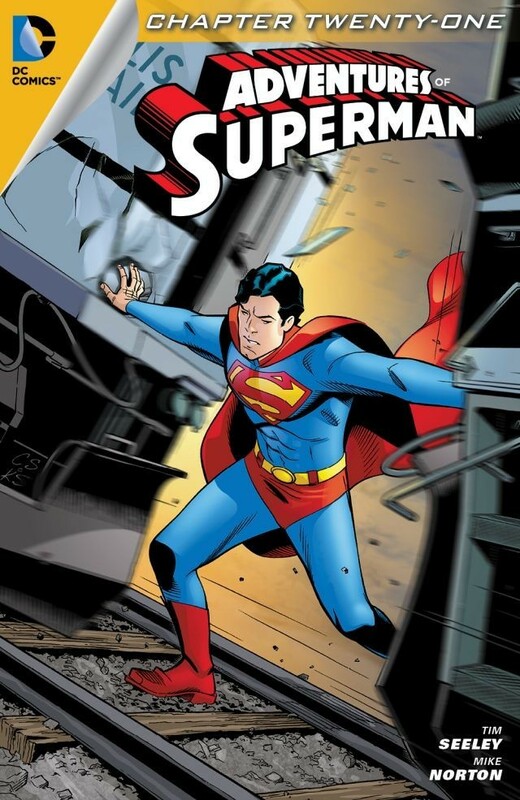 So many of these Adventures of Superman issues are bursting with heart that they are among the most delicately written Superman stories we've ever had. 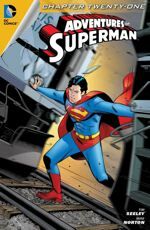 Tales of young, scabby-kneed boys playing superhero and a mother's loving lament have helped elevate Adventures of Superman to lofty yarn spinning heights not oft experienced in other mainstream comic books. However, there are other stories in this out-of-continuity title that are so dry and lethargic that their pitchy mundanity risks shadowing the fewer tales that gleam with excellence. 'Space, Actually, is an unfortunate mix of both. Tonya's story plucks them ol' heartstrings, no matter the brevity. It is a fine example of how Superman can be put into a real life situation and use compassion, consideration, and voice to be just a normal person taking the time to care. Sadly, we have to sift through an undercooked co-plot involving Darkseid, Diana and J'onn, and pollen to get back to Tonya. I can't shake the feeling that writers - and editors - feel like we always need to see Superman destroying something in order to believe that he's saved something else. It's made clear that Superman saved Tonya, not only from her plunge from the tree, but more so from her absence of hope. If the snoozery of the Darkseid nonsense (forgive me, great Master of Anti-Life!) wasn't given so much real estate, I would have given 'Space, Actually' a 4; if Tonya's story was fleshed out a bit more, it would have been a 5. Now and again, especially with stories this short, it's just nice to see Superman's muscles take a backseat while his heart does all the heavy lifting. Art - 5: Beautiful. Sometimes the easiest words are the most appropriate. Panel 1 of page 14; the main panel of page 17; page 19; panel 2 on page 22 (all in the digital version) - all examples of how simply beautiful Norton's pencils and Bellaire's colors are here.